The EZ Puller Model EZP-24 is ideal for facilities that require only a few battery changes each day. 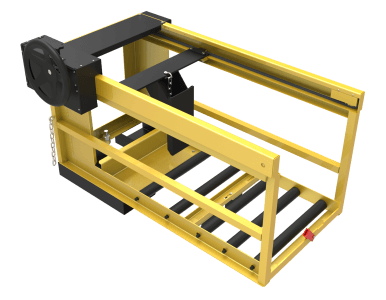 It can be mounted to a single pallet truck or it can be ordered with convenient fork pockets for use on multiple trucks. Fork pockets are available for standard fork sizes 27", 42" or 48" in length. The unit features a 4-to-1 hand crank that makes it easy to remove or replace lift truck batteries. The safety latch located in front of the battery carriage is used to lock the battery in place while it is being transported. For powered push/pull, please contact us. Max. Battery Weight 3000 lbs.